Discussion in 'MSI' started by etcetera, Feb 10, 2019. I am confused. My machine, MSI Titan GT80S SLI "Skylake" sometimes takes over a min to boot and sometimes just 30 seconds, weird. 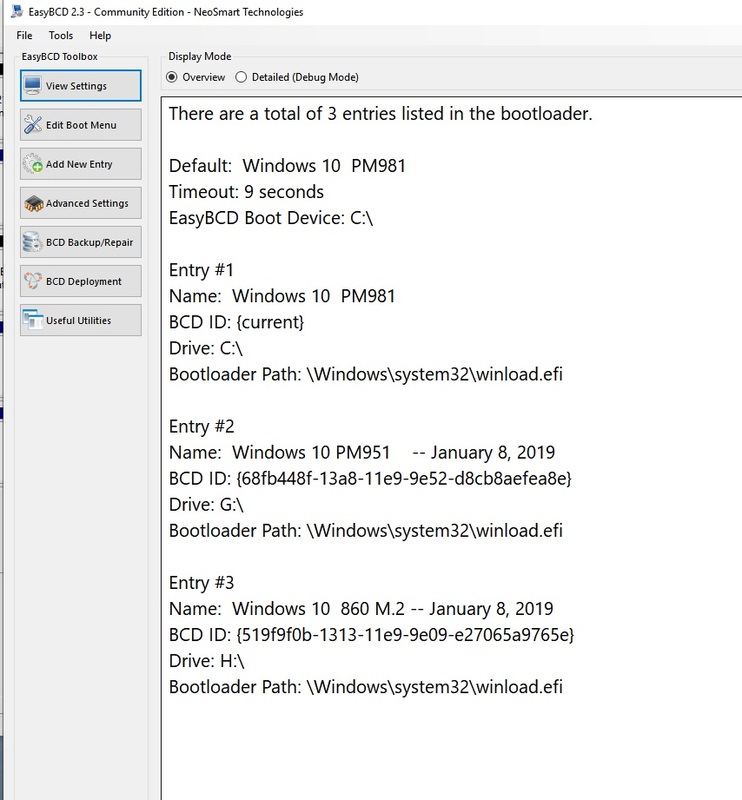 I wonder if the boot sequences as defined in UEFI has something to do with it. It does not look right. The first disk that appears there, 860 EVO, is not the primary boot disk. Neither is the second one, PM951. 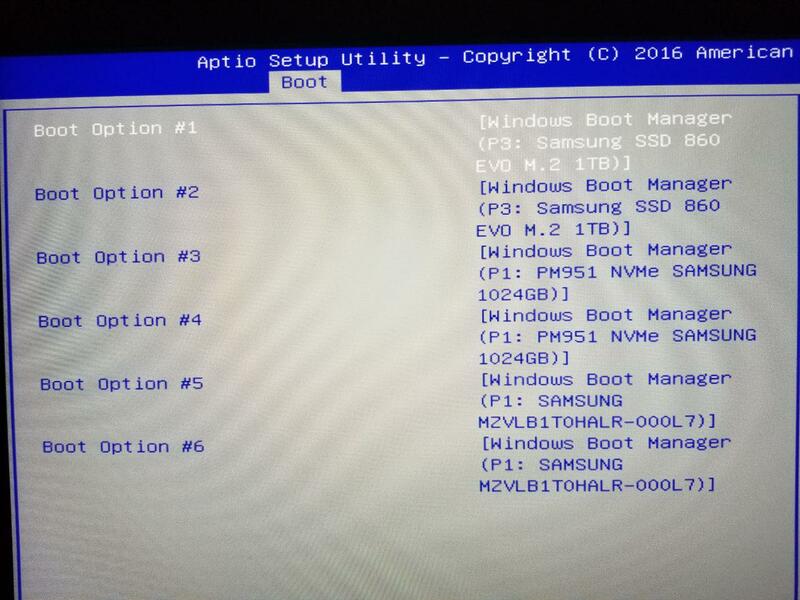 The one at the bottom (option 5 and 6) is PM981 that is the primary Win10 boot disk and that defined in the bcdedit. This is how the it's seen in Disk Management. PM981 is the disk 0 or C:. That's the primary boot disk. Should it not show up in the UEFI as the first disk (option 1 and 2)? And that is the actual boot menu resulting from bcdedit configuration. It is correct. There are 3 bootable disks in the system right now, the boot disk can be selected by scrolling up/down and hitting enter. All that works but that still raises the question why in UEFI the primary boot disk is not choice 1 which is the top, or default choice here. Could it be that the machine tries all the options until it gets to the correct one and that explains the slight timeout at times? Those P1,P2, Pn reflect partition numbers of different ESPs of different drives. Its correct. I had the same problem as you. The only solution is to open your laptop, get all drives out and leave just the primary one. When you boot from that drive that one will become default primary in BIOS and that is the only way that worked for me. After that one become primary you can back all the drives and everything will work properly. @etcetera There's another way. Since you're using only Windows, its recommended by most OS that there's should be only one ESP. So you can extend the current 100MB ESP to 260MB or 500MB and delete other disks's ESP partition and let windows reconfigure the bootloader to use PM981 ESP as container to hold every other disk's Windows OS. 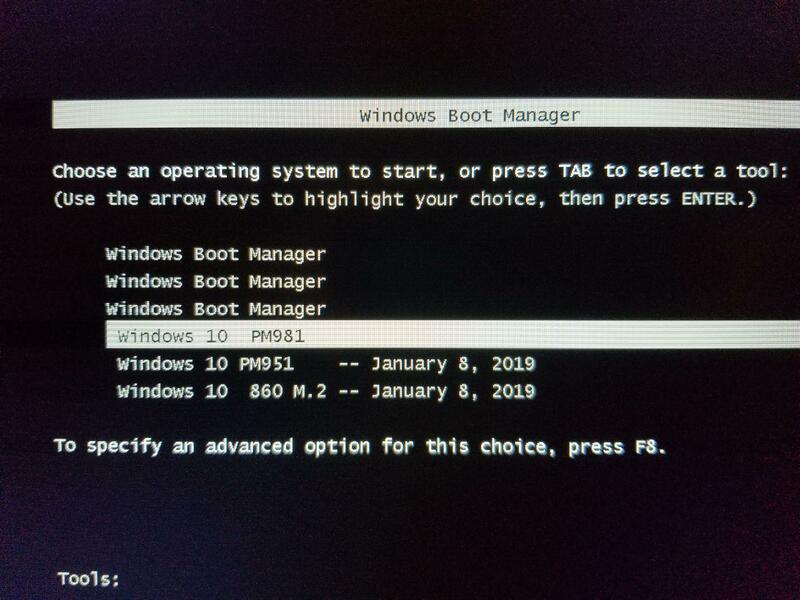 So in your BIOS screen only one will be listed with win boot mgr and you'll see/get a boot menu which allows you to select which OS to boot! Does M11x support UEFI boot?